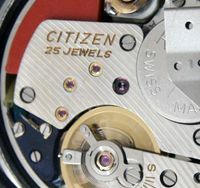 The Rhythm company became affiliated to Citizen in the mid 1950s, and clocks and some watches continued to be made using that name. This 30 day pendulum clock requires very little adjustment, typically about 30 seconds when being wound so only 1 second or so per day, which isn’t bad for a 50 year old piece. 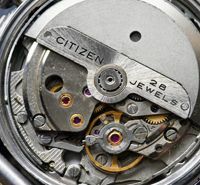 The day date feature is great, as is the power reserve indicator which scrolls from right to left until it is completely red to indicate that winding in required. It also strikes on the hour and half hour, but the bell is pleasantly soft so it can be running all the time without disturbing the whole house! 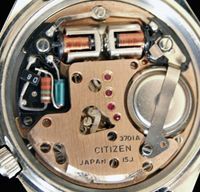 6 Responses to My Most Accurate Timepiece…..
Hello Its a long time I have this old Citizen watch and can not find any information about him. 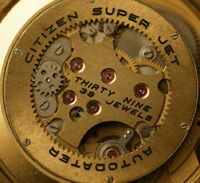 Would you be so kind as to send me some details about the watch (photos added), model?, manufacture date?, original band? and any other relevant information. Thank you in advance. Daniel P.N. The watch works perfectly. 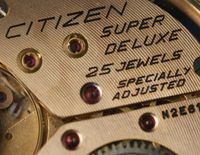 Hi I need some help, I have a citizen 21 jewels and I can`t find the model anywhere, I´ve googled the numbers in the back with no results. Can I send photos to your email? Thanks.